Panorama view from Hungry Hill looks west into the Kalmiopsis Wilderness. A grove of Brewer’s spruce is seen growing along the right side of the picture. Click image to see enlarged view. Drive five miles north of Cave Junction and turn left on Eight Dollar Mountain Road (the intersection is next to mile marker 24). The first four miles of this road are paved but after crossing the bridge over the Illinois River, the road turns to gravel. About a half mile on this gravel road there is a fork. Stay to the right and follow the road going up hill. Continue for another 11 miles to another intersection with a road on the right. Continue straight ahead (don’t turn right) for another half mile to the Babyfoot Lake trailhead (42.224619, -123.792939). The road continues but may not be accessible if the gate is closed. 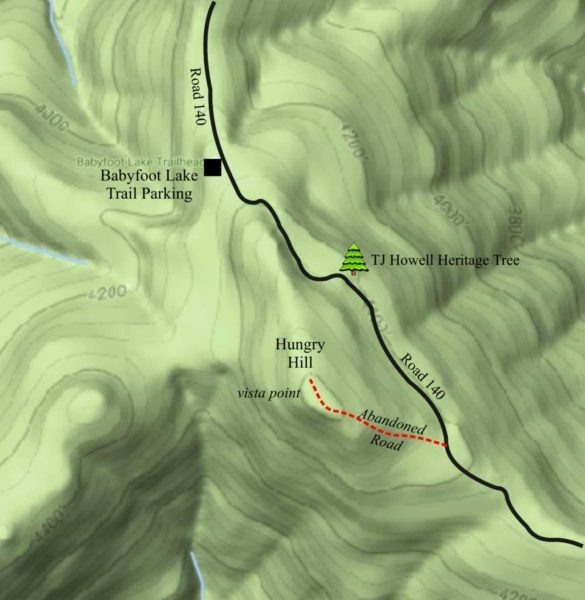 It is recommended to park at the Babyfoot Lake trailhead and walk. 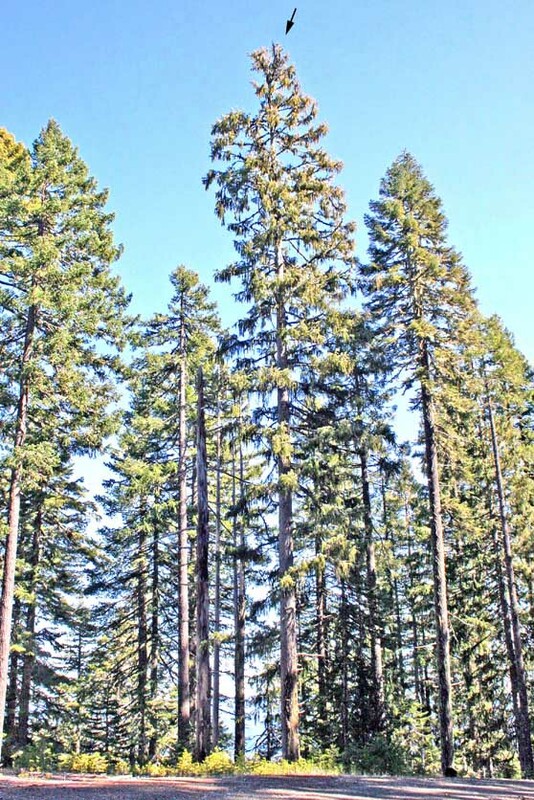 Hungry Hill has some of the best preserved stands of the rare Brewers spruce in Oregon, a tree with a very small natural range in southwest Oregon and northwest California. You can see this tree growing along the road and on the top of Hungry Hill. One of these trees is designated by the State of Oregon as the Thomas Jefferson Howell Heritage Tree. Howell discovered this species of tree in 1884 along a trail near the Oregon-California border. It is the last tree species to be discovered in the United States. 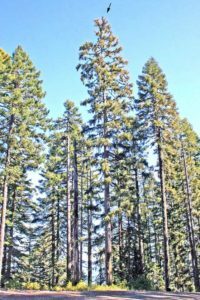 The Heritage Tree recognizes Howell’s discovery but also his renown as Oregon’s first pioneer botanist. From the Babyfoot Lake parking area, follow the well graded road for about a half a mile and watch for a distinct but overgrown two-track road going off to the right. Follow this road to the top of Hungry Hill. The route is not maintained so it is likely you will need to go around recently fallen trees. The Brewer’s spruce has distinctive galls on the tips of many branches. This is the only tree in the region that has these and just about every Brewer’s spruce has them.